Click here to order your copy of Revenge of the Blood Beast! At age 25, British director Michael Reeves seemed poised to embark on a truly remarkable film career, but then something strange happened: He died. When he passed away from an accidental barbiturate overdose, Reeves had three pictures to his name. Those include the 1967 Boris Karloff sci-fi horror flick The Sorcerers, 1968’s Vincent Price cult classic Witchfinder General (a.k.a. The Conqueror Worm), and his first feature, 1966’s Italian horror romp Revenge of the Blood Beast (a.k.a. She Beast). The latter has gotten a first-class Blu-ray from the folks at Raro Video, far superior to the terrible pan-and-scan versions that have circulated on DVD over the years. The film stars horror stalwart Ian Ogilvy (From Beyond the Grave, And Now the Screaming Starts! ), a friend of Reeves who appeared in all three of his films. The main attraction, though, is fright icon Barbara Steele (Black Sunday, The Pit and the Pendulum, Nightmare Castle) as the wife of Ogilvy’s character, who unfortunately drops off the face of the Earth after a scant 20 minutes of screen time. Don’t fret, Steele comes back towards the end for a little ironic coda, but it’s unfortunate that the filmmakers could only afford her for a four days. Ogilvy and Steele play a newlywed couple taking their honeymoon through Transylvania (naturally), where they stumble upon a funny old Count Von Helsing who tells them both of his family’s history wiping out Dracula as well a still potent witches curse. After Steele goes missing in a car accident, Ogilvy spends the remainder of the runtime frantically searching for clues as to where she may have gone to. 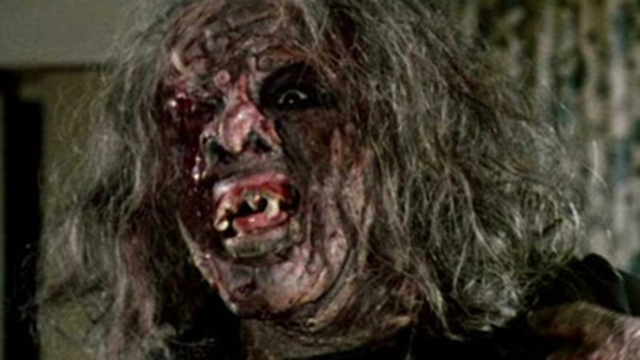 He eventually teams up with Von Helsing to outwit the witless communist police force and do battle with a centuries-old witch, whose look and mannerisms would feel right at home in Sam Raimi’s Evil Dead movies. This is a slight but silly oddity that showed Reeves was delighted to subvert genre expectations and apply liberal doses of humor, including a great sight gag where the evil witch kills a man with a hammer and sickle. He gets a lot of mileage out of a very low budget Italian quickie production, and the transfer itself looks fantastic compared to what’s already been available in previous years. 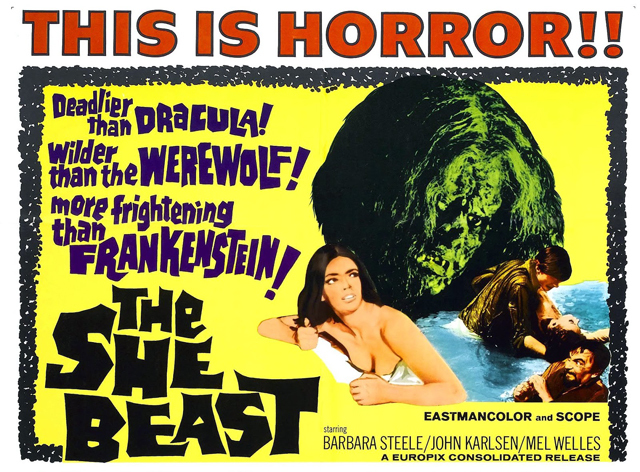 Raro’s package includes a booklet with details about the making of the film, though the big only feature is a 30-minute interview with Barbara Steele which is less about Revenge of the Blood Beast than it is an overview of her time working in Italy in the ’60s. It’s a wonderful interview where she waxes nostalgic about working with guys like Mario Bava and Federico Fellini. Unfortunately, Raro was only able to intersperse the conversation with footage from Blood Beast and the other movie of hers that they put out, The Long Hair of Death. While the interview is great, the production of the feature is a little slapdash, from the mediocre (albeit audible) audio quality of the recording to the collage of stills layered over it often haphazardly. It would have also been good to get at least a short featurette about Reeves and the career he could have had, including movies he was set to direct, including The Oblong Box and De Sade, both eventually made by others. Still, this is a fun little flick that genre fans with a bizarre sense of humor should get a kick out of.